The availability of new storage technologies such as Serial Attached SCSI (SAS) and Solid State Drives (SSDs) have given small to medium businesses an opportunity to have high-end storage networks for a fraction of the cost. 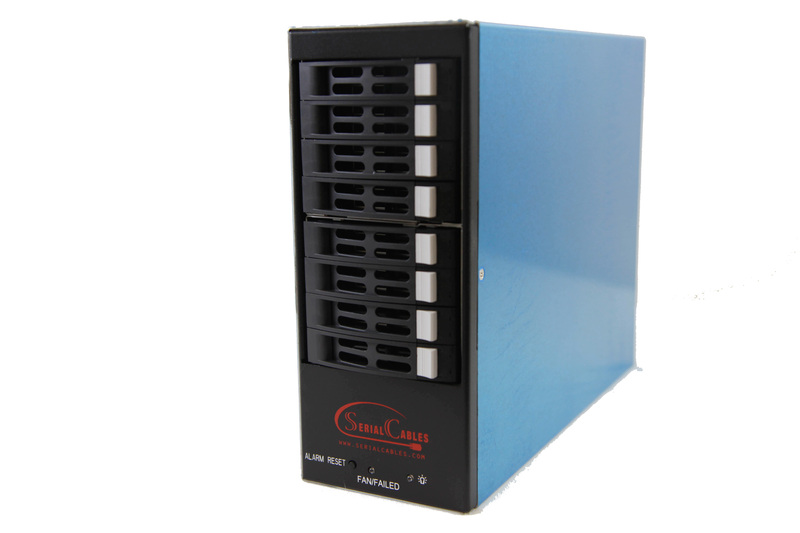 The Serial Cables SA-ENC12G-01A 8-port SAS/SATA Direct Attached Storage (DAS) JBOD enables an easy upgrade to your business network’s needs; adding up to 32TB of storage using 4TB drives, and an incredible throughput of up to 1200MB/s (100% Sequential Reads) when using the latest technology SAS 12G SSDs. The SA-ENC12G-01A 8-port, 2.5″ SAS/SATA JBOD includes specially designed and manufactured SF-8644 cables for directly attaching the SAS or SATA drives directly to the backplane; reducing noise, EMI, and other potentially harmful signaling connection issues. The backplane is a specialized Quarch (www.quarch.com) design, capable of supporting up to 12Gbps SAS or 6G SATA HDDs or SSDs with clean signaling . Also available for purchase is a kit that allows the user to install 2 JBODs onto a storage rack measuring 2U.